Where do I use my Lebara Mobile voucher code? Lebara pride themselves on allowing their customers to stay in touch with their loved ones, wherever they may be in the world at an affordable price and flexible rate. Whichever corner of the world your family, friends or loved ones are, Lebara has got you covered. Choose between an all-in-one, national, international, data or bolt-on plans or even a SIM only plan which you can get from as little as £5. There are no hidden charges either! Browse online today and select a phone & plan to suit you with top-ups available. Whether you’re looking for something low-cost or don’t mind spending extra to make the most out of your Lebara mobile, you’re sure to find something suitable for you. Featuring a huge selection of both premium smartphone to class, affordable phones, Lebara aim to go the extra mile to ensure you’re able to stay in touch. What’s more, if you need help, Lebara offer a multilingual customer service hotline so don’t hesitate to get in touch for specialist advice. Check out our selection of money-saving deals & discount codes on our Lebara Mobile page today and find an additional discount to make your next Lebara Mobile purchase even more affordable. 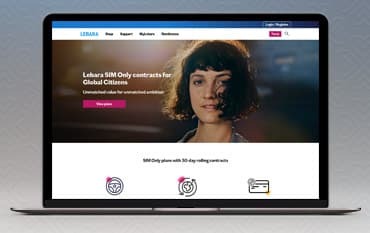 If you’re a Lebara customer, you will be pleased to know that you can take control of your account from one simple and easy to use area online! Managing your account is straightforward and can make your Lebara experience that extra great. Simply log in and check your balance online, and if you need to top-up, the option is there to do so. By checking your account regularly, you will be able to keep track of your spending & usage so you know exactly if Lebara is working for you. Keep an eye out for a Lebara Voucher Code on our deals page so you can get more texts, calls and data for your money. The Lebara All-In-One does exactly what it states - you get absolutely everything all in one! Featuring Data, National & International Texts & Calls, there isn’t much more you could ask for. With this plan, you can use your international minutes in over 40 different countries so no matter which corner of the globe your loved ones are, they’re a call away with the Lebara All-In-One plan. Check out what the plan can offer you today and don’t hesitate to save money using a unique voucher code you can pick up now from our deals page. How do I top up online? Topping up online is simple and fuss-free. You can either top up from the Lebara App or using SMS from your phone. If you don’t have a Lebara account, you can still top up your credit without needing to register. You can also top up online using your Lebara account details. If you’re worried about running out, you can also set up an auto top up which is the best way to never get caught short again. Find more information on topping up here. As the world’s very first international mobile phone service, Lebara proudly caters to international communities at low-cost prices. Launched in 2004, Lebara has since been helping you keep in touch with family & friends both near and far at prices you can afford. You can keep those costs to a minimum using one of our Lebara Voucher Codes making it even more affordable to top up your credit and keep in contact with those you love. Enjoy a Free SIM only offer or choose one of the wide arrays of monthly plans available at prices to suit everyone. Wherever you are in the world, staying in touch has never been so affordable.